What is an atheist, theist, agnostic, etc? Who created the Universe, Earth and Man? When I bought my Lenovo Yoga 2 11, I removed Windows 8.1 and replaced it with Ubuntu Linux 14.04. After a couple of weeks I decided to replace the HDD with an SSD, and in doing so, I also wanted to re-install Windows 8.1 (together with Ubuntu in a dual boot configuration) to use with the Yoga in “pad mode”. I didn’t find a complete instruction on how to do this (had to search a lot to complete different parts), so I decided to write it all down while doing it in the hope that it might make it easier for someone else. 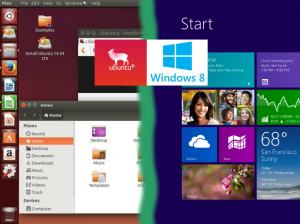 You can also use this post if you just want to install Ubuntu 14.04 – either together with an already installed Windows 8 or as a replacement to Windows 8. Just skip the irrelevant parts. When you install Windows, the installer will not be able to properly detect the Yoga’s WiFi adapter. So it will not not install the appropriate drivers, meaning that you will not have WiFi during or after installation of Windows until you have fixed this by downloading the correct drivers. When you install Ubuntu, it contains a broken kernel module for Lenovo laptops, meaning that you will not have WiFi in Ubuntu either. At least not until after the installation when you can fix this as described further down. The installation ofÂ both operating systems, as well as fixing the problems after the installation, will go much smoother if you have an Internet connection from the beginning. So I strongly recommend that you get yourself an Ethernet-to-USB adapter,Â likeÂ this oneÂ (since the Yoga 2 11 doesn’t have an RJ45 Ethernet contact). Both Windows and Ubuntu will be able to use that from the start. All you need to do is to plug the USB contact into the Yoga 2, and a network cable into the RJ45 connector in the adapter. Alternatively, you can “thether” your mobile phone to the laptop over USB (WiFi doesn’t work, remember? and neither does Bluetooth – at least not on Ubuntu) and use it to connect to Internet. Both Windows and Ubuntu will however want to download quite a lot of stuff, so this option might be both slow and expensive. You could also get away with downloading what you need from another computer and move it to the Yoga on a USB flash-drive, but for this guide, I will assume that you have the USB-to-Ethernet adapter that I recommend. A Windows 8.1 installation DVD. A USB-connected DVD reader, like this one. An empty USB flash-drive. Note that it must be an actual flash drive – not some memory card adapter. An Ethernet-to-USB adapter, like this one. The DVD reader and the Windows DVD is only for the Windows installation, so if Windows is already installed on your Yoga, you won’t need those. Connect the laptop to the power adapter (installing the OS on battery power is not the best idea). Connect the DVD reader to a USB port on the laptop (if installing Windows). Connect the USB-to-Ethernet adapter to a network cable, and to the other USB port on the laptop. Remember that only one of the USB ports on the Yoga 2 11 is a USB 3 port. So if any of the devices above have a USB 3 connector, you might want to use the “right” port for it to gain reading speed. The “Lenovo button” is the tiny round button next to the power button on the right-hand side of the Yoga 2. Press the Lenovo button andÂ select BIOS Setup from the menu. Go to the SecurityÂ page and see toÂ thatÂ Secure BootÂ is set to Disabled. Go to the Boot page and see to thatÂ USB Boot is set to Enabled. You need to prepare a Ubuntu Live USB to install Ubuntu from. The only trick to this is that the USB needs to be prepared for UEFI boot to work on the Yoga 2. Never mind what that means for now, just follow the simple instructions below. First you download an Ubuntu 14.04 ISO image. Note that it needs to be a 64-bit version for it to work with UEFI. Just follow this link and select the version you want. To write the Ubuntu image to a bootableÂ USB flash-drive, you will need a small piece of software called Rufus (assuming that you do this from a Windows PC). I’m sure there are others that work just as fine, but I like Rufus. Download it from here (it’s free). Click Start and wait until it’s done. It will take a couple of minutes. Obviously, you can skip this section if you already have Windows installed on the Yoga. Note 1: If the hard driveÂ in the laptop is empty (for example if you are now installing the OS because you replaced the HDD with an SSD), you will probably get the message “No Bootable Device. Hit any key.” at some point(s) during this process. If that’s not obvious by itself, just do as it says and press any key to continue (though in this case you actually need to press the Enter key – other keys do nothing here). Note 2:Â When starting up the laptop with a bootable CD/DVD in the reader, you will sometimes (randomly it seems) get to the Boot Selection menu instead of just getting the “Press any key to boot from CD or DVD” message. If that happens, just select the DVD reader from the menu and continue from there. Note 3:Â I’m going to assume that the hard drive is empty, or that you at least will allow any previous content to be destroyed. If you have stuff on it that you want to keep, or if you want to make some extra clever partitioning of the drive, then you will need to take care of that on your own (and adjust the instructions below accordingly). Start the laptop, open the DVD and insert the Windows 8.1 installation disk. When the laptop restarts, you will see the message “Press any key to boot from CD or DVD”. You will then have a couple of seconds to do that. If you’re not fast enough, the Yoga will skip the DVD boot, and what happens then depends on what is currently on your hard drive. In any case you will just have to reboot to get the option to boot from DVD again. After that, you just have to follow the instructions on the screen to install Windows. Unfortunately, the Windows installer will not be able to find the right drivers for several of the devices in the Yoga 2 – for example the WiFi adapter. So we need to install these manually. Go to the Lenovo support page for the Yoga 2 11. In the Downloads tab, select “Windows 8.1 (64-bit)” in the Operating System drop-box. The list of downloads now shows all the available stuff for your Yoga 2. There are quite a lot of them, but not all are strictly speaking needed. I installed all of it (except for the BIOS update which I assumed was already installed) just to be safe, but you could also go with installing it as you find that you need it. You will likely want to install the WiFi (“WLAN Driver (Broadcom, Qualcomm Atheros, Intel)”) drivers at the very least, though. The Windows installation is currently using all of the space on your hard drive. Well, not using it, but the Windows installer have created one large partition on the hard drive using all the free space, and Windows is reserving that one for itself. So we need to shrink that partition to make room for Ubuntu. Start up Windows on the laptop, and open the Disk Management Tool. Now, I’m not comfortable around Windows 8.1, so I’m not really sure about the easiest way to find stuff, but at least I found this tool in the context menu when right-clicking the bottom left Windows icon. In the Disk Management window, right-click the C: drive, and select Shrink Volume from the context menu. A dialog will now open that tells you about the size of the disk volume and how much you can shrink it. Unless you have already started playing around with Windows and have installed new stuff, it shouldn’t currently occupy more than 10-15 GB. How much of the drive you should use for Ubuntu and how much for Windows depends on which one you think you’ll be using more. I’m not really sure about that myself, but I decided that from the 250 GB SSD that I installed, I would use 60 GB as C: for the Windows system, 100 GB as a common data partition (shared between Windows and Ubuntu), and the rest for the Ubuntu system. So the first thing I did here was to shrink C: to 60 GB. You need to enter the number of MB to shrink it with rather than how big you want it to be, so I guesstimated a number and ended up making it 61.47 GBÂ – close enough. Then I created the shared partition that I wanted (which of course is completely optional). Right-click the “Unallocated” section of the disk and select “New Simple Volume” from the context menu. This starts the New Simple Volume Wizard, which is pretty straightforward. I used it to create a 100 GB NTFS partition named “DATA” and assigned it the drive letter D: (had to unplugÂ the DVD reader and reboot to make D: available). Just leave the rest of the disk as “Unallocated”. We’ll be dealing with that during the Ubuntu installation. Turn off the laptop, unplug the DVD reader (if you haven’t already) and insert the Live Ubuntu USB drive that you prepared earlier. Press the Lenovo button and select Boot Menu from the menu. Then select EFI USB DeviceÂ (your flash-drive) in the Boot Manager, and press Enter. When you get to the GNU GRUB boot menu, select Install Ubuntu. After that, just follow the instructions on the screen until you get to the “Installation type” screen. The default option here is to “Erase disk and install Ubuntu” but that will of course wipe the Windows 8.1 installation. Select the Something else option, and click Continue. This brings you to a presentation of the disk file system. The “free space” item in the listÂ represents the part of the hard drive that you left as “Unallocated” when shrinking the Windows partition earlier. 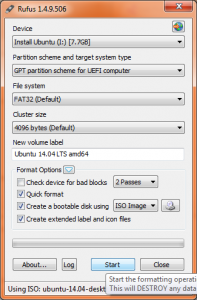 Here you will create three partitions for the Ubuntu installation. Note that there might be more than one item named “free space”. The one we are talking about here is the large one, consisting of as many gigabytes that you left free earlier when shrinking the Windows partition. The other ones (if there are any) will be just a couple of megabytes in size. Select the “free space” item in the list andÂ click the “+” button below the list. 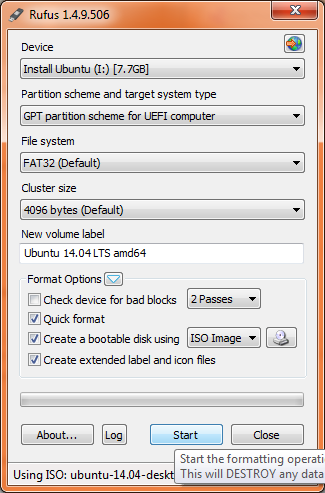 This opens the Create partition dialog where you enter the attributes of the new partition to create. In my case, the home partition got to be 48031 MB (47 GB). If that sounds a bit on the small side, remember that we’ll also have the shared 100 GB “DATA” partition to store stuff on. The installer will know how to use the new partitions by what mount points you assigned, so now you can click the Install Now button to start the actual installation. When installation is complete, you will be told to reboot. When you do this you will find that starting your laptop will now open the GRUB boot menu, where you can select to boot Ubuntu or Windows. By default, Ubuntu is pre-selected and will boot after a couple of seconds unless you press a key. There are a couple of things you need to take care of after the installation in order to make Ubuntu work better on your Yoga. As you may already have noticed, neither WiFi nor Bluetooth is working in Ubuntu. The reason for this is a broken module, specific for the Lenovo Ideapad laptops. The module is named ideapad-laptop, and is a core Linux module, meaning that the problem is with Linux in general, and not with Ubuntu specifically. Follow the instructions in my earlier post, Activating WiFi in Ubuntu on Lenovo Yoga 2, to correct the ideapad-laptop module and amend these problems. You may also have noticed that you cannot use the (F11 and F12) back-light control buttons. If you press them, you will see the light control slider go up and down, but the back-light intensity doesn’t actually change. Copy the file contents from above and save the file. Reboot the Yoga and you should now be able to control the back-light intensity. If you open the Mouse & Touchpad dialog in System Settings, you will see that there are no touchpad settings at all. There is something wrong with the drivers for the ElanTech touchpad of the Yoga 2, but I didn’t bother to learn the details. I did however find a fix for it here (post #137 by kendatsuba). Download the file provided by kendatsuba by right-clicking this linkÂ (this is just a copy of the original file posted in the forum mentioned above) and save it in ~/workspace/ideapad. And that’s it. You can see that it worked by openingÂ theÂ Mouse & TouchpadÂ dialog inÂ System SettingsÂ again. Now there is a section with settings for the touchpad.